At the end of Saints Row, the protagonist was aboard Alderman Richard Hughes' luxury yacht when a bomb exploded on the yacht leaving the fates of Hughes and The Protagonist (Player Character) unknown. 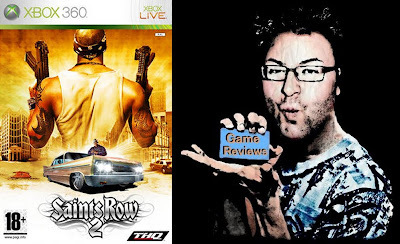 In Saint's Row 2, it is revealed that Hughes was killed and The Protagonist was put into a coma. Five years pass and the Protagonist awakes in a prison hospital ward and received extensive plastic surgery. The protagonist meets inmate Carlos Mendoza and the pair escape the island and return to the protagonist's home city Stilwater, rebuilt by the Ultor Corporation after a devastating earthquake that left parts of the city below sea-level. First off, the game is similar to the GTA games. Run around the city looking for crap to do, but if I had to choose one word to describe the difference, it would have to be "Insanity". The customisation is also excellent. Weapon - The AS14 Hammer Shotgun, Ultor invented this fully automatic shotgun for users with no concern for civilian mortalities, only to see their target blown to pieces. This weapon has a high rate of fire, making it an ideal weapon for room sweeps and gang wars. Some Sons of Samedi carry this and it costs $10,000 from Friendly Fire.